Climbing onto the tower crane top in three minutes, the girl began to lift up the iron bars, steel and other building materials, and discharged them at the designated spots with great speed and a high degree of accuracy. Liu Jiaqiong, a 25-year-old girl from northeast Yunnan�s Daguan County impressed us recently by her skillful operation on a 70-meter tower crane at the Spring Eye, another landmark building under construction in Kunming, Yunnan Province. At the Kunming building site, you can see only a few women, and those driving a tower crane are even rarer. "Well, I�ve been doing this for quite a few years," Liu Jiaqiong said with pride, "Maybe you could never image that I used to be an acrophobe." 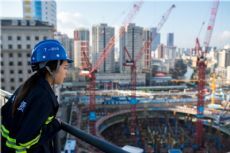 The idea of being a tower crane driver hit Liu Jiaqiong five years ago, when she worked as migrant worker in south China�s Guangdong Province and was impressed by the pictures taken by her friend, who was also a tower crane driver. Knowing about her dream, the family said it hard for a girl to drive a tower crane. But Liu Jiaqiong, who was a little boyish and daring since childhood, stuck to her dream, despite opposition from some family members. 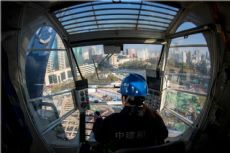 To be granted a crane driver license, Liu Jiaqiong tried hard to overcome acrophobia. Liu can still remember the fright that almost collapsed her when she climbed the tower crane halfway up for the first time. To overcome acrophobia, Liu trained herself hard, climbing onto the tower and staying with the master driver in the cab as much as possible. With great effort, she got the driver license half a month later. In the past three years, she has taken part in building many high-rises. "Now, I am building the Spring Eye in Kunming, which is twice as high as the tallest I have ever built," said Liu.